What happens when the oil runs out? Sit and think about that for a while, and you may well come up with something very like the setting of The Windup Girl, where nearly all coastal cities have been drowned by rising seas, cars are a luxury only government ministers can afford, and carbon emissions are strictly rationed. Bangkok survives, but only because the Thais were stubborn enough to surround it with high sea walls. Humanity is now, tentatively, on the rise again, but nature no longer allows any margin for error. With electricity so hard to come by, the huge advances in electronics that we’ve come to expect from novels set in future centuries are nowhere to be found. Instead, technology has gone down another avenue: genetic manipulation. The work of heavy machinery is now done by megodonts – genetically modified elephants, twice the size – and it’s not unusual to see fruits on market stalls that didn’t exist yesterday. Instead of computer hackers and software pirates, we have “generippers” and “genehackers”. But far from solving the post-oil world’s problems, GM tech has caused most of them. All mankind lives in fear of horrific plagues, created in labs and then spun out of control to sweep the globe. American companies with stereotypically corporate-sounding names like AgriGen, TotalNutrient and PurCal own the patents to the only plague-resistant foodstuffs (sterilised, of course, to prevent consumers growing their own), and aren’t shy about enforcing their intellectual property rights to keep starving nations eating out of their hand. It’s not quite clear whether the calorie companies actually created the plagues on purpose, but they certainly benefit from them. The result: every calorie, and every joule, is carefully counted. Thailand has kept its people safe from the Scylla of plagues and the Charybdis of starvation only by virtue of a fanatical purism. This is enforced by the Environment Ministry, whose officers (“white shirts”) raze acres of land at the barest hint of disease (tough luck to anyone who lives there) and watch the ports like eagles to make sure nothing biological comes in from other countries. But chinks are appearing in the armour: widespread corruption among the white shirts means smuggling is getting easier, and the Trade Ministry, which wants to allow imports and bring back 21st-century style global free trade, is growing in influence. Conflict is brewing, and no-one knows quite when, or how, it will come to a head. 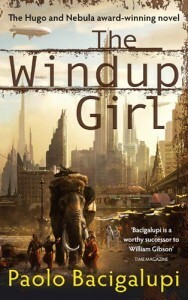 The Windup Girl is the intersecting stories of five people with very different places in this dystopian world. Anderson Lake is an American employed by AgriGen, running a failing kink-spring (low-tech energy storage) factory as a front for his real mission: finding the most valuable thing imaginable, a suspected seedbank. His foreman, Hock Seng, is a “yellow card”, a refugee genocide survivor from war-ravaged Malaysia, trying desperately to survive in the slums and rebuild his fortunes on wits alone. Jaidee Rojjanasukchai, the “Tiger of Bangkok”, and his taciturn deputy Kanya lead the only non-corrupt group of white shirts, trying to stand up for their principles against political pressure. And finally we have the windup girl herself, the most unusual character in the book: Emiko, the Japanese slave clone. It’s very hard, maybe impossible, to write a dystopian post-GM/fossil-fuel-apocalypse novel without coming across as preachy, but Bacigalupi (and since I know you’re wondering, it’s “Ba-chee-ga-LOO-pee”, and he’s an Italian-American) gives it a damn good try. Helpful features are that the book is set convincingly in Asia, meaning it doesn’t feel as though it’s trying to shock you by directly showing America In Ruins™ (cf. A Canticle for Leibowitz), and that the action is exciting enough that you don’t get sick of learning more about the setting and its history. In fact, as I reached the second half I was a little disappointed that the worldbuilding didn’t continue, and I was thinking about preachiness more because I expected it than because it was actually there. There are occasional moments when characters reflect on how stupid and wasteful we were in the 21st century, and how casual with what is to them enormous wealth (i.e. a piece of fruit, now extinct), but it doesn’t happen unrealistically often. They’re also unreasonably paranoid about the tiniest carbon output – at one point Kanya looks at a few government computers and imagines she can feel the seas rising as she watches – but if this is taken as something they’ve been conditioned to think, rather than at face value, it makes more sense. Genre-wise, the book is pleasingly quirky. Strictly speaking it’s science fiction, since it’s set in the future and has more advanced technology than we do now. But the feel of it couldn’t be further from traditional chrome-plated sci-fi with sleek spaceships and microbe-free surfaces. These people are amazed to see a car and fear that every cough is a plague. Crossing the Pacific takes weeks. Androids are made not of silicon but of flesh. So rather than sci-fi, the feel is steampunk: the setting is a crowded city, devices are powered mechanically rather than electrically; and there’s even that staple of steampunk, travel by dirigible. Religion, both fanatical and might-as-well-pray, is everywhere (hardly surprising given what a mess science has made) and ghosts are widely believed in – so much so that it’s unclear whether they’re actually real within the story. It feels odd for a novel set in the future to be so casual with the supernatural, and this underlines what I see as an important theme: human nature doesn’t change. Times are hard and calories scarce; it’s every man for himself, and the whole plot is driven forward by the interactions of many self-interested people living at close quarters. This makes it intuitively easy to relate to but hardly encouraging as a vision of the future. It’s not entirely pessimistic, however – there are many examples of human ingenuity and resourcefulness at which it’s hard not to smile, even while saddened at the circumstances which make them necessary. The book’s pace is mostly fast enough to keep it exciting, though there is a bit of a lull in the middle. The description is vivid but not overdone, learning the Thai words for peculiarly local things is fun, and the ending is shocking but not out-of-the-blue. This book would make a great action/disaster movie if done right. Bacigalupi has clearly done his homework about Thai culture – the book felt as though it could have been written by a Thai (though of course, if there are any inaccuracies, I wouldn’t know it). The Windup Girl is an impressive and thorough imagining of the world after the kind of apocalypse we’re most worried about now that the Cold War is over – it's refreshing that he didn't go for the now-overdone nuclear theme. The consequences of the starting premise are mostly well thought through, although the odd glitch can be spotted. For example, it’s unclear why nuclear power isn’t used, or how the calorie companies are able to enforce their patents so rigorously in the face of mass starvation and the breakdown of governments. But overall, it’s a compelling picture, and it gets its message across by telling a story you enjoy reading rather than by bludgeoning you with propaganda. This is definitely a book that all kinds of people will enjoy and keep on thinking about, even non-sci-fi readers. Four out of five cycle rickshaws.